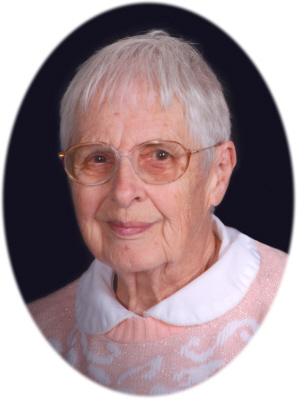 Marian L. Acker age 90 of St. Louis, MI, passed away Sunday, August 5, 2018, at Rosewood Adult Foster Care, Ithaca, MI. Funeral Services will be held at Smith Family Funeral Homes St. Louis, MI on Wednesday, August 8, 2018 at 11:00 A.M., with Pastor Phil Maxwell officiating. Burial will take place at Oak Grove Cemetery, St. Louis, MI. Visitation will be held on Tuesday, August 7, 2018 from 6-8 P.M. and on Wednesday at 10:00 A.M. for one hour prior to the service at the funeral home. Marian was born in St. Louis, MI on February 18, 1928 the daughter of Lloyd and Elva (Elliott) Peach. She was a lifelong resident of St. Louis and graduated from St. Louis High School. Marian married Deward "Duke" Acker on December 15, 1946 in St. Louis. Duke passed away on November 29, 2017 after 72 years of marriage. Marian liked to needle point, quilt and knit. She also enjoyed going to garage sales and working in her flower beds. Spending time with her grandchildren was her greatest joy as well as spending time with family and extended family. Marian and Duke loved to go camping and take walks together. She attended St. Louis First Baptist Church. Marian is survived by her daughter Janet Acker of St. Louis, MI; son Jim and Sally Kay Acker of Mecosta, MI; 5 grandchildren: Elizabeth and Norbert Reehl, Bryan Acker, Tammy and Kevin Doerksen, Rebecca Crum, David and Samantha Acker; 5 great-grandchildren: Kaitlyn, Kendyl, Elianna, Micah and Owen; brother Bill and Susanne Peach of Alma, MI; and sister Evelyn and Richard Pawson of St. Charles, MI. Marian was preceded in death by her parents, husband, brother Melvin Peach and sister Doris DeRosia. Memorials may be made to the wishes of her family. Online condolences can be sent to www.smithfamilyfuneralhomes.com. The family is being served by Smith Family Funeral Homes, St. Louis, MI.